Hi everyone, Joe here. Now, you may remember that at the end of my last NXT review, I got bored and went for a Twix (it was an excellent Twix by the way, thank you for asking). Of course, two weeks later the site went on hiatus as well so I thought what with the big relaunch I'd give you all a primer on what you might have missed as you haven't had my NXT reviews to tell you because let's face it, none of you actually have the time to watch TV, just to read someone who thinks his opinions matter more than yours words on the subject. With that out of the way, let's jump in. Shortly before I left for that delicious Twix (other caramel biscuit chocolate bars are available. For instance Chocolix, which is a delicious GF alternative), Roode was engaged in a heated war of words and occasionally more than words with Roderick Strong. This led to a rather superb TV match where Roode utilised the most dangerous finishing move of all, threatening Strong's family. If you didn't know, he has a wife and child. Anyway, in the weeks following this match, a Number 1 Contenders match was made between the undefeated Drew McIntyre & Killian Dain during which I can only imagine Aleister Black and Velveteen Dream were sitting backstage going '...sup?' (before you argue this point, Tommy End and Patrick Clark took losses, not Black and Dream). So after a match that hit all the beats of McIntyre's in-ring work in NXT so far, kicks, strikes, looking bored, the former IC champ came out with a victory. So with the build set for McIntyre vs Roode at Bound for Glory, sorry, Takeover Brooklyn III, it all seemed straightforward but Roode can't quite shake Strong who's not even bothered about the title anymore, he just wants to get retribution from Roode. So the match is set for this week: McIntyre vs Strong, if Strong wins, he gets Roode after Takeover, for the title if Roode still has it. 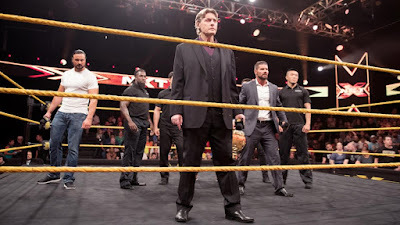 What's been fascinating about this angle is it has managed to improve the standing of all three men as Roode continues to be in contention for best NXT champion (he's up there with Owens and Neville), Strong builds his babyface support/credibility and by putting McIntyre on the mic with something to say, he's showing some of the aggression and intensity that we all want to see from him in the ring by simplifying his character down to someone who got too cocky before and now needs to prove himself by doing some serious Twix-kicking. Let's hope they can take this momentum and deliver in the ring as well. So while we were away Heavy Machinery, otherwise known as those two big lads who we can't confirm weren't on WCW back in the day but seem a tad too young, failed to attain the NXT Tag Team Championships in a match that everyone can agree happened and no one can remember anything about. Still, adding further credence to my theory that Eric Young died in the cage with Tye Dillinger, the team of SaNIty (Killian 'Fuzzy Wuzzy' Dain & Alexander Wolfe) as led by Nikki Cross are the latest to try and work out what this whole book of pain is about and how Paul Ellering's reading from it if the Authors are still writing it. Well, who doesn't love big lads trying to kill each other? 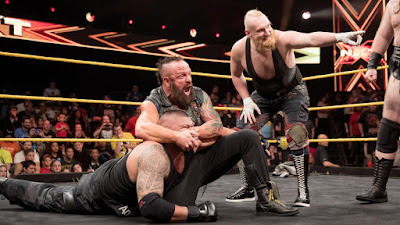 Anyway, here's hoping that SaNItY win the title and avoid comparisons to the Wya... what's that? Rowan and Harper won the NXT Tag Titles aswell? Oh well, guess it's probably too late to avoid comparisons now anyway. So just two weeks after I complained about Asuka vs. Nikki Cross being really lethargic, they came back with a Last Woman Standing match that was everything I've wanted to see from the NXT Women's division putting on possibly the best WWE Women's match of the year (so far, there's still a whole tournament to get through). After that match was over though, the question was what's next for the still to be unthroned Empress of Tomorrow? Enter again, Ember Moon, back from injuries after a Twixt of fate left her out of the recent multi-woman frivolities, fresh off great matches with Peyton Royce and Ruby Riot and declaring herself the worthy next Number One Contender. With quite how good their Takeover:New Orleans match was, it's hard not to see the re-match being great. Also in regards to Asuka being seemingly unstoppable, all streaks come to an end. 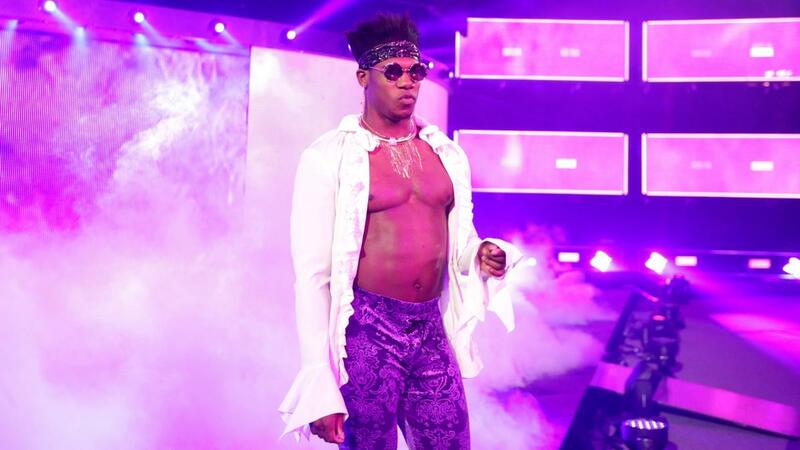 Patrick 'The Velveteen Dream' Clark continues to go from strength-to-strength as he builds both some surprisingly impressive performances and gains confidence on the mic. Sure, we still have no idea who the Velveteen Dream is beyond he's 'definitely not Prince' but will we be saying Nothing Compares 2Him soon? Well... watch this space. 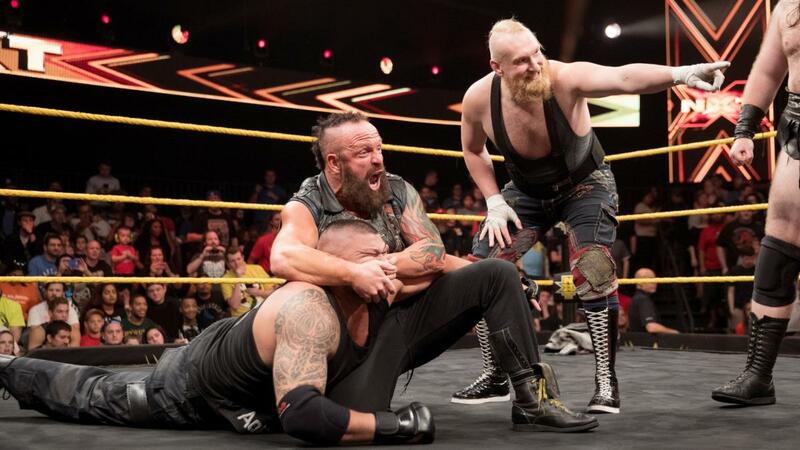 After having been betrayed by his friend and tag partner Tommaso Ciampa as part of WWE's year long commitment to it's new branding 'WWE - Friendship is Dead', Johnny returned to NXT just in time to get himself on the card for Brooklyn. He spoke about trying to move past DIY and get back to being Johnny Wrestling again. Now armed with a swanky new theme tune and a 'never-say-die' babyface persona unscarred by what Ciampa did, he seems ready to move on but does the spectre of Chicago still hang over him? The Iconic Duo wants a wing of the Performance Centre to celebrate them. Give them their wing. If you won't give them proper TV time, at least give them a wing. Itami seems to just be angry that he doesn't win everything or maybe he's annoyed at people who injured him or maybe he just likes kicking bins and swearing. Anyway, a few weeks back, he had a match with Kassius Ohno, his good friend as you can tell because the commentary mentioned it a few teams, that ended with him hitting a low blow before trying to kick the Twix (it was a great Twix) out of his good friend. Sure Ohno has a win but after the brutal beating he took, their feud is set to reach fever pitch at Takeover as Itami takes on... Aleister Black? Because that makes sense. Though I do accept that maybe what they're doing is selling the beat down Itami gave to Ohno and also as I said he likes kicking things and Black is a thing. Plenty more kicks to follow. 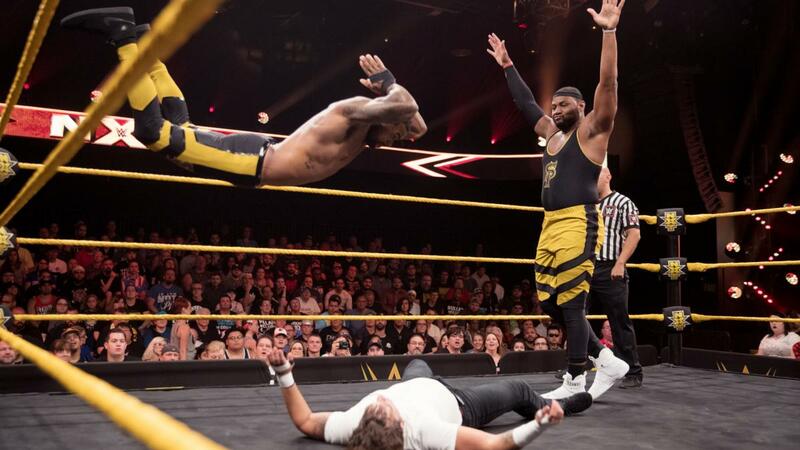 The Street Profits AKA Instagram Stories: The Wrestling Team made their debut in a quick, decisive match over the Metro Brothers AKA Grease Off Broadway: The Chorus Ensemble. 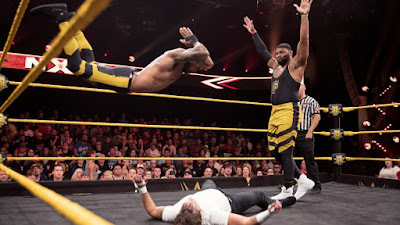 Montez Ford looked impressive, even managing to style out a wobbly landing off a backflip and Angelo Dawkins seems to have finally found a way to get that 'stir the pudding bowl' thing he loves so much over with the audience. 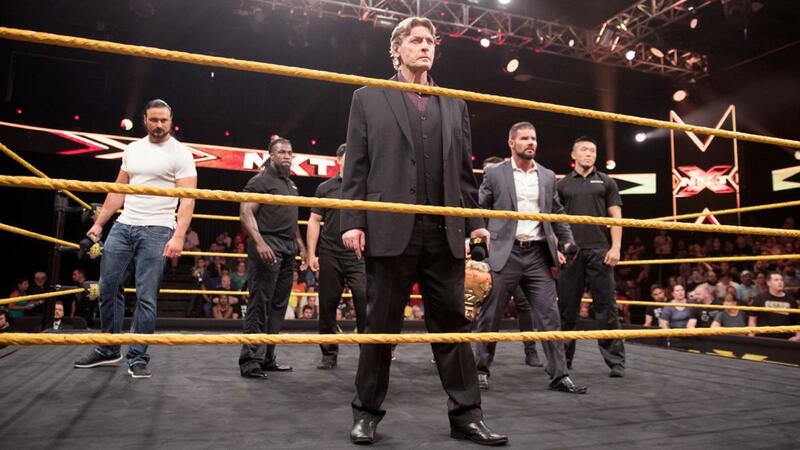 With Street Profits, Authors of Pain, SaNItY, Heavy Machinery, TM61, potentially a reunited ReDragon (more on that later), Burch & Lorcan and if we're really pushing it, Moss & Sabattelli, the NXT Tag Team division might be about to see a renaissance. Or they might not, I don't pretend that hope makes sense. Oney Lorcan has been on a tear putting on great matches even though he's never allowed more than about five minutes, he also seems to be frequently, 'accidentally' making things bleed. Lorcan seems to be single handedly trying to turn NXT into CZW very slowly. He also seems to be building a friendship/rivalry with Danny Burch (still known on the indies as Martin Stone) based off their ability to punch each other. 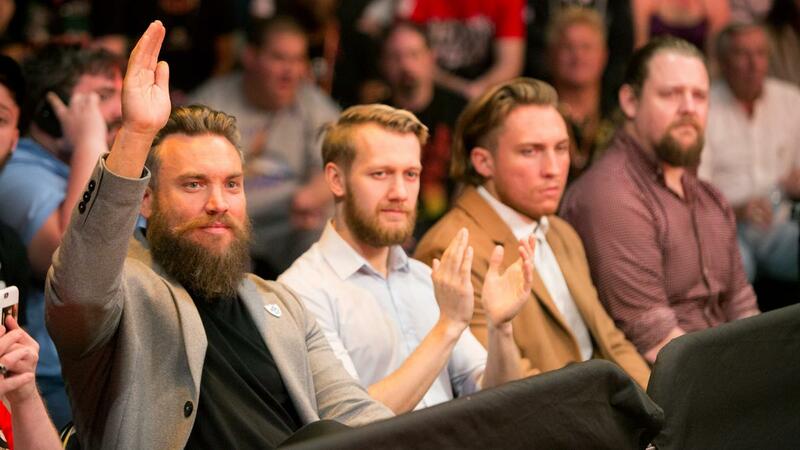 If I know anything, this could lead to the formation of a new tag team and if this year has shown me anything, eventually Lorcan will betray and murder Burch. More power to them, probably. So now, you're all caught up, we hope to see you every Thursday back here for the NXT reviews and of course join us over the weekend for coverage of Takeover and Summerslam.